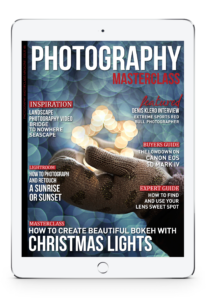 Learn Exactly How To Use Christmas Lights to Create Beautiful Bokeh Backdrops For Your Images, In This Issue of Photography Masterclass Magazine! Christmas is a great time for photography and with all the colourful Christmas lights around it’s the perfect opportunity to create some beautiful bokeh images. Using Christmas lights as a backdrop you can create beautiful and unusual out of focus balls of light behind your subject. This technique takes a bit of practice but is pretty simple once you get it right, and in this issue we show you exactly how to create gorgeous bokeh effects with your own Christmas lights to make some truly beautiful and artistic images. + In a great behind the scenes landscape photography video, watch photographer Kevin Roberts as he takes a seascape shot of the “Bridge to Nowhere” while standing in the sea and getting soaked by the incoming tide! + We show you exactly how to find and use the sweet spot of your lens, so you can always get the sharpest images possible with the lens you have. + We interview extreme sports photographer, Denis Klero, who's been shooting for Red Bull since 2007. He has travelled all around the world for his work, and considers his most memorable location to be Mount Everest, where he covered an extreme base-jumping project. + In our Lightroom video tutorial, find out the best secrets for shooting and retouching strong sunset and golden hour shots. + We showcase an amazing film shot using experimental filmmaking techniques such as time-lapse, high-speed, and stop-motion photography. + We also give you the lowdown on one of the most highly anticipated full frame all rounder cameras of the year, the Canon 5D Mark IV. It's been a 4 year wait, but is it any good?